Thinking of holidaying in Cambodia? Before you visit this intriguing Southeast Asian destination, be sure to check out some of the top things to do in Cambodia. 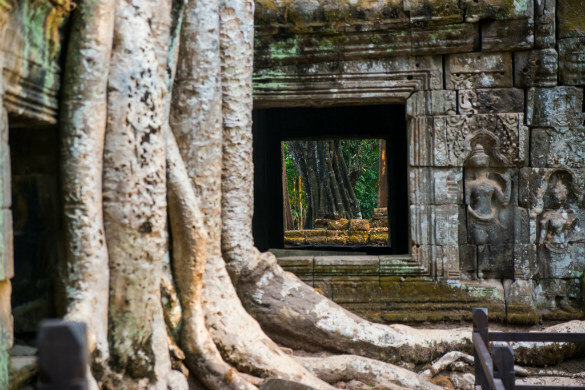 From breathtaking historic sites to unforgettable experiences, a trip to Cambodia is sure to be one to remember. Angkor Wat, Cambodia. Image Credit: Bryon Lippincott / CC by ND 2.0. Particularly spectacular at sunrise and sunset, Angkor Wat is perhaps one of Cambodia’s best known attractions. Considered to be one of the largest religious monuments in the world, the site’s sprawling structures are thought to have been built more than 800 years ago during the reign of the Khmer Empire. Adorned with spectacular carvings, awe-inspiring statues and incredible monuments, the complex can take a while to explore, so set aside anywhere between three hours and half a day depending on how comprehensively you plan to explore. As the complex is still considered to be a religious site, dress modestly when visiting to avoid causing offence. Just a short distance from Angkor Wat, Angkor Thom is another of Cambodia’s unmissable historic attractions. Established as a new capital for the Khmer Empire, and eventually becoming its last, the site now stands as a reminder of the grandeur of this once mighty kingdom. There’s plenty to see across the site, with some of the most popular structures including the Terrace of Elephants (a viewing platform carved with images of elephants) and the Banyon (a temple covered with several towers and a number of smiling and serene stone faces). 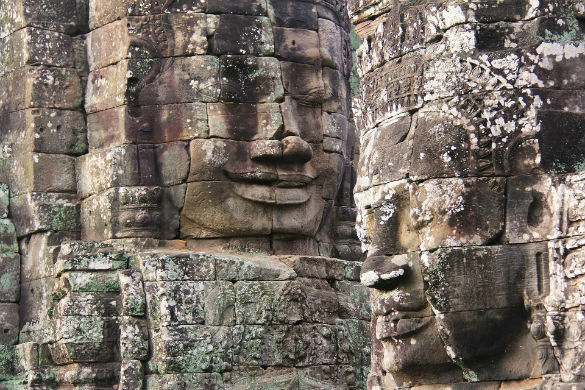 To discover all that Angkor Thom has to offer, it’s recommended that you set aside half a day. Royal Palace, Phnom Penh, Cambodia. 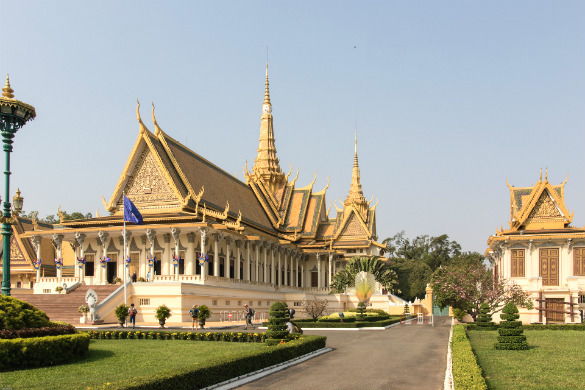 Built in the mid 19th century, Phnom Penh’s Royal Palace is both an icon of the city and the current residence of Norodom Sihamoni, the current king of Cambodia. The building features ornate gilding and plenty of elegant elements that have long been associated with Khmer design. Although the majority of the palace is off limits to tourists, you can still visit the Throne Hall and the Chan Chhaya Pavilion. Within the compound, you’ll also find the Silver Pagoda, an extravagant Buddhist temple, which is open to visit. Decorated with silver floor tiles, crystal sculptures, Italian marble and a trio of gold, silver and bronze Buddha statues, it’s an incredible sight to behold. Said to be the largest lake in Southeast Asia, Tonle Sap Lake is a waterway that interestingly grows and shrinks noticeably depending on the previous wet season’s conditions. 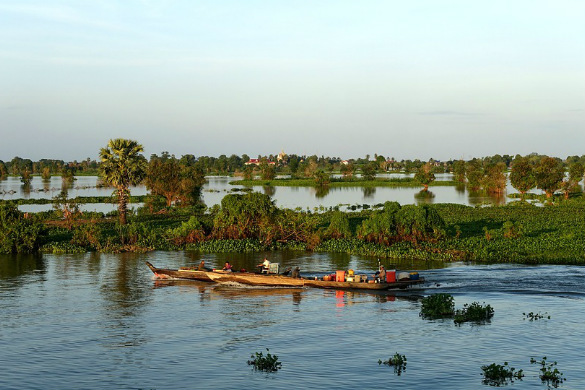 Home to a number of floating villages and a wide assortment of marine life, a tour of the lake, which connects to the Mekong River, offers an insight into the way that locals have lived and worked for generations. Set out on a boat tour and admire the scenery, get to know some of the friendly locals and be sure to keep an eye out for the variety of fish, birds and other creatures that call the lake home. Tuol Sleng Genocide Museum, Phnom Penh, Cambodia. Image Credit: Christian Haugen / CC by 2.0. Under the rule of Pol Pot, it is estimated that around a quarter of Cambodians were killed by starvation, disease or execution in the 1970s by the Khmer Rouge. Although these events took place more than forty years ago, their immense impact on the country remains to this day. Acknowledge the scale of this man-made tragedy with a visit to the Killing Fields and the Tuol Sleng Genocide Museum, which aim to bring the stories of those who perished and the brutality of the Khmer Rouge to light. 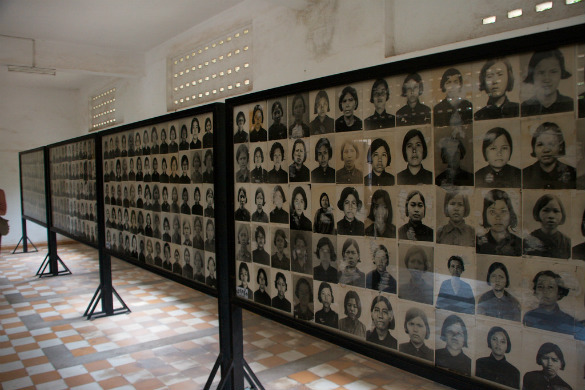 Featuring prisoner photographs and artefacts related to this brutal period of history, both the Killing Fields and the Tuol Sleng Genocide Museum are sobering reminders of unchecked political power. 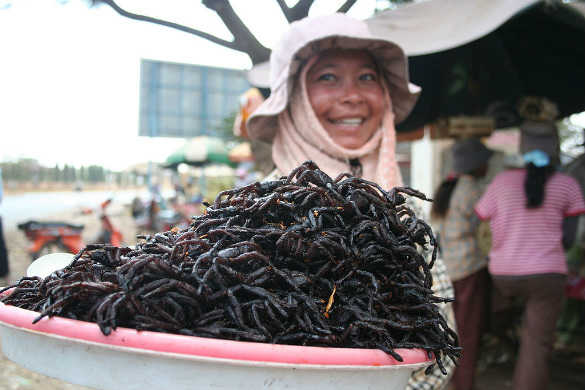 Fried spiders at a market, Cambodia. Image Credit: Mat Connolley / CC by SA 3.0. Bordered by both Vietnam and Thailand, Cambodia certainly holds its own in the culinary world. Sharing some similarities with the cuisines of its neighbours, the local dining scene stands out thanks to its use of fresh seafood and produce, its intriguing spice blends and the incorporation of fragrant ingredients. Alongside delectable curries, stir fries and noodle dishes, you’ll also find some interesting options, including red tree ants with beef, grilled whole squid and, of course, the infamous insect skewers sold at markets and by roadside vendors. From fried spiders and crickets to some of the best curries you’ll ever have, Cambodian cuisine is certainly worth sampling at least once in your lifetime. 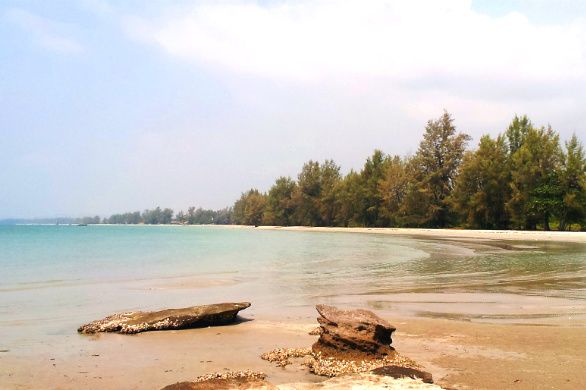 Otres Beach, Sihanoukville, Cambodia. Image Credit: Wikirictor / CC by SA 4.0. Although it is home to quite a modest stretch of coastline and just a few islands, Cambodia boasts a number of beautiful beaches that are a worthy addition to any Southeast Asian itinerary. With plenty to choose from, some of the best are considered to be Sok San Beach on Koh Rong (a 7 km white sand beach), Otres Beach in Sihanoukville (a quieter alternative to some of the area’s more popular beaches) and Sokha Beach in Sihanoukville (a clean private beach which includes pool use in the entrance fee). Each of the country’s beaches offers something a little different in terms of popularity, cleanliness and views provided, making it easy to find one to suit your personal preferences. 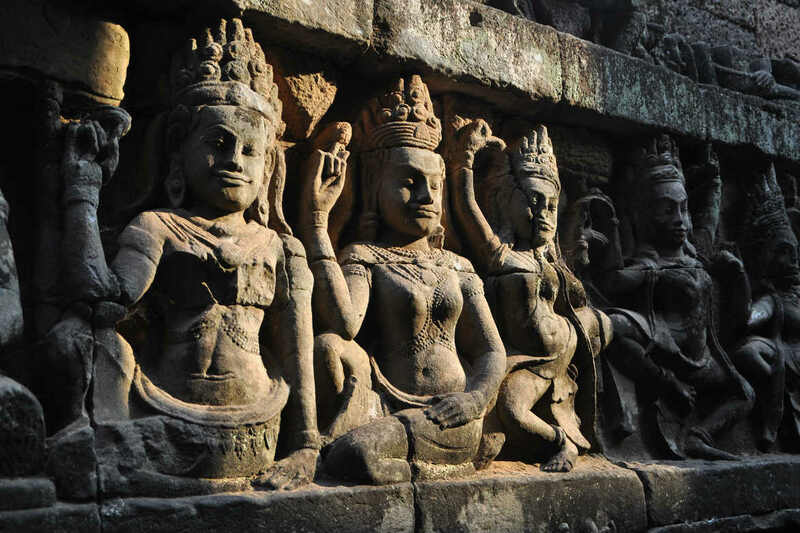 Want to discover the beauty and history of Cambodia firsthand? Secure you place on a Southeast Asia tour from Webjet Tours today!